Albinko Hasic is a PhD student at Syracuse University, whose research concerns U.S. military propaganda. In 1917, James Montgomery Flagg created his iconic Uncle Sam poster encouraging American men to join the war cause with the clear message, “I want you for the U.S. Army!” as the U.S. ramped up preparations to enter World War I. Even though this was not the first instance of propaganda posters being employed on behalf of a war cause, the visual medium proved to be effective in the military’s recruitment drives and posters were routinely used to boost morale, encourage camaraderie, and raise esprit de corps. Posters were cheap, easily distributed, and fomented a sense of patriotism and duty. In World War II, the U.S. turned to artists once again in an attempt to influence the public on the home front. Today, these posters offer a glimpse into American society and the efforts to mold public opinion in the country. Rolled out on a massive scale in World War I, the popularity of posters as propaganda only further increased in World War II. With the surprise attack on Pearl Harbor in 1941, the U.S. began mobilizing once again but not just militarily. The U.S. government leveraged hundreds of artists across the country to deliver important messages through visual means. This included some relatively famous artists such as the creator of Aquaman, Paul Norris, whose sketches were noticed by his superiors during his time in the military. The artists’ designs were not just focused on the rank and file of the military either. The Office of War Information (OWI) believed that the ‘home front,’ was just as sensitive to enemy misinformation, and went to work creating a series of posters specifically focused on the population back home as the engine of the war effort in Europe and the Pacific. 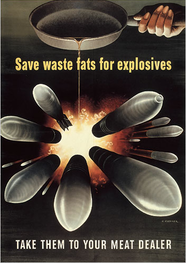 The designs and posters had a wide range in terms of messaging and design. Even though there was quite a number of posters in the U.S. with xenophobic or down right racist messaging and visuals, the majority centered around themes of tradition, patriotism, duty, and honor. This was further expanded on the home front with themes such as conservation, production, work ethic, buying war bonds, tending to “victory gardens,” encouraging women in the labor force, and cementing a common enemy in the eyes of the American public. 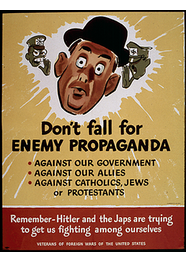 Several U.S. propaganda posters employed a tactic known as demonization. This involved portraying the enemy as barbarian, aggressive, conniving, or simply evil. Demonization included derogatory name calling including terms such as “Japs,” “Huns,” and “Nips,” among others. 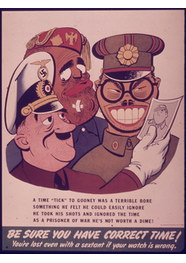 Several posters in the U.S tapped into demonization by showcasing the Japanese with overly exaggerated features and by recycling racist and xenophobic personifications. 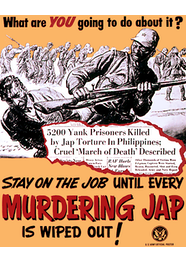 This was often paired with messaging such as one anti-Japanese poster which portrayed Emperor Hirohito rubbing his hands saying, “Go ahead, please take day off!.” The tactic was clear, motivate the working population at home to avoid sick days through fear of the inhuman enemy who is planning an attack on the homeland at any moment. Some posters employed comedy as a way to break through, while at the same time tapping into the overarching fear of the enemy. 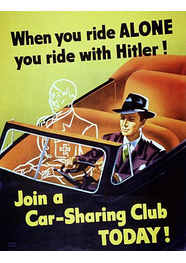 For example, one poster, seemingly in an attempt to encourage carpooling, depicts an outline of Adolf Hitler riding shotgun with a commuter with the messaging, “When you ride alone, you ride with Hitler.” Others encouraged high production outputs by likening slacking off with aiding and abetting America’s foreign enemies. 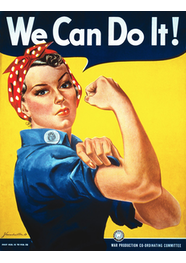 At the same time, others were more positivist in nature such as the famous Rosie the Riveter “We can do it!,” poster, encouraging women in the workforce. Perhaps one of the most fascinating themes which were propagated on the home front is misinformation and “loose talk.” Some scholars have speculated that this theme emerged out of fear of domestic spies and foreign intelligence operations within the U.S. Others, however, maintain that the U.S. intelligence services had shut down any foreign intelligence networks even prior to America’s involvement in WWII. Their claim is that these types of messages merely aimed to dispel rumors and prevent a loss of morale at home and abroad. Whatever the case may be, the government asked illustrators to discourage the population at home from casual chatter about troop deployment, movement, and any other sensitive information which could be “picked up,” by enemy receptors or propagated on a large scale. The phrase, “loose lips sink ships,” emerged thanks in part to the work of Seymour Goff. 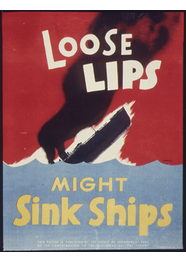 Goff’s poster depicts a U.S. boat on fire, sinking with the words, “Loose lips might sink ships.” Similar messaging was also prevalent in Great Britain and Germany as well. Just as World War II was fought with bullets, boats, tanks and planes, the war at home was fought with information stemming from sources such as movies, radio, leaflets, and posters. Artists suddenly became soldiers on the front to win the hearts and minds of the American public. 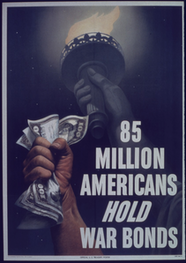 Propaganda posters offer us an interesting insight into the objectives of the U.S. government and the war time aims of the mission to create consensus at home.